Wanting to look fabulous in The Division 2? Here's what you need to know about Dyes and where to find them. Wanting to bag regular supplies of high-end loot? Here's 24 Airdrop locations to farm. Looking for those hidden SHD Tech caches that aren't on the map? 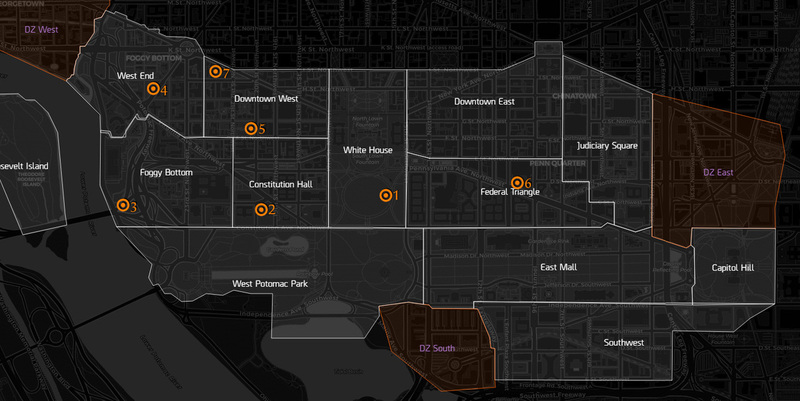 Here are their White House locations. Here's how to farm the olive weapon crates in The Division 2 for weapon skins. Olive weapon crates in The Division 2, found in world and story Missions that contain 2 items and a weapon skin. While you might have encountered several as you've played, they can actually be farmed on a 24 hour timer and there are specific locations where they always spawn. Kataki has written a brilliant guide on these locations, and we've used his screenshots below. Big thanks also to Sleepwalker in Recon Gaming who has had this on farm for a while. There is a map posted below with more specific screenshots for each location and there are at least 1 olive crate hidden in every main story Mission. How often can I farm them? The chests reset 24 hours after opening. How long do I have to farm them for? It should take you 1-2 days to obtain all skins. There are 10 weapon skins in total, with skins carrying over to any alt accounts and with no duplicates. Available only on Bounties and Side Missions. At the bottom of the hole, at the end of the tunnel. American History Museum: A random golden key will drop from an enemy, you can use it to open a secret room in the jungle room. To read the latest guides, news, and features you can visit our The Division 2 Game Page. Lewis is currently playing The Division 2, and Risk of Rain 2, having covered a variety of genres for many years.